Whether you are in the planning stages, or are ready to go to the next level, we're here to help you with free mentoring and low-cost training. Volunteers can meet with clients at convenient locations around South Central Minnesota. Are you starting a business in Mankato, Waseca or Owatonna? Do you need confidential business advice on growing your business in Albert Lea or Faribault? The experts at South Central Minnesota SCORE Chapter are here to help with no-cost business counseling and low-cost workshops and small business classes. We offer aspiring business owners and entrepreneurs with business mentoring, assistance writing a business plan, templates and more. We help people start a business or expand an existing business in Albert Lea, Faribault, Mankato, Owatonna and Waseca. South Central MN SCORE, Chapter 710, Counselors to America’s Small Business, is part of a national nonprofit association dedicated to entrepreneur education and the formation, growth and success of the nation’s small business. Visit our national website at SCORE.orgor the Minnesota District website at SCORE-MN.org. SCORE is a national organization structured by regions, districts and chapters. Our chapter is a member of the Minnesota District of SCORE. 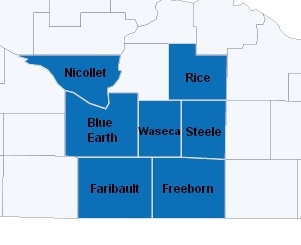 Serving the seven-county area of Nicollet, Blue Earth, Faribault, Freeborn, Steele, Waseca and Rice, we have a local presence in Albert Lea, Faribault, Mankato, Owatonna and Waseca. We offer free confidential small business advice, entrepreneur training, business plan templates and more. Aspiring business people, as well as those with existing businesses, may schedule an appointment with a SCORE expert to discuss all varieties of business related topics. Let us help you startup and grow your business today. South Central MN SCORE is organized around a concept we call Local Links. Each community wanting SCORE presence within Chapter 710 will be able to organize its own link.This enables us to provide SCORE mentoring to business clients locally within their own communities. Unusual or specific client needs have access to the resources of the whole chapter.This arrangement forms a collaborating partnership of communities. Each Local Link is responsible for its own development as well as development of Chapter 710. Each Local Link has SCORE members, a local sponsor (Chamber of Commerce, Economic Development Agency, College, etc.) and a local contact number & address. Each Local Link participates in the chapter organization, meetings, business needs and chapter training programs for members as well as clients. Chapter 710 maintains contact with the MN SCORE District 508, other SCORE Chapters and submits annual reports to the national SCORE organization.